Media Circus: Who Won? The Moderator : It's All Politics With guns blazing, Martha Raddatz took over the reins of Thursday's vice presidential debate and never let go. 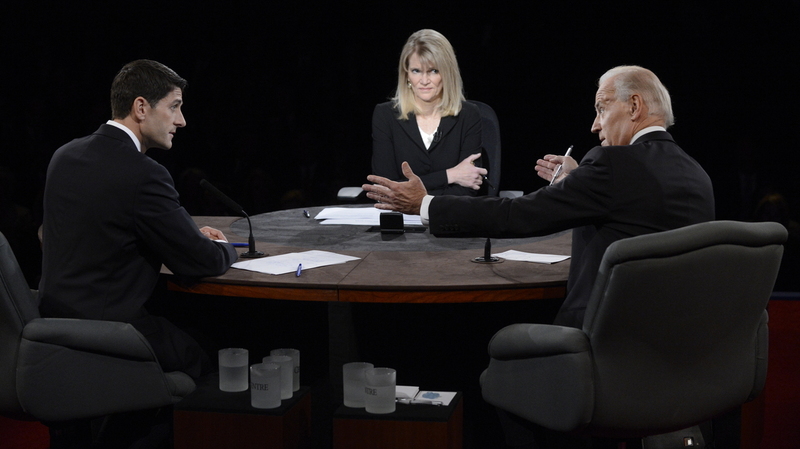 While Vice President Biden and GOP Rep. Paul Ryan engaged in an intense face-off, Raddatz kept the debate moving, ultimately becoming the one uncontested winner of the evening. Vice President Joe Biden speaks as Republican Rep. Paul Ryan and moderator Martha Raddatz listen during the vice presidential debate at Centre College on Thursday in Danville, Ky.
Atmospherically, the vice presidential debate pitted old versus new. Vice President Joe Biden lives in a world where no lily goes ungilded, and every 'lative is super. Rep. Paul Ryan speeds through campaigning energetically, like the heroic train in the new movie Atlas Got Cut Using the P90X Workout. And the moderator Martha Raddatz? She came out guns blazing. No avuncular, passive Jim Lehrer she. Indeed, Raddatz started the evening with a touch of Catskills, telling people in the audience, "I've spent a good deal of time in war zones, so I'm not used to sitting with my back to the audience." First question to Biden on the assault on the American consulate where the U.S. ambassador to Libya and three other Americans were murdered: "Wasn't this a massive intelligence failure, Vice President Biden?" Later to Ryan, on former Gov. Romney's detail-free promise to reduce taxes and eliminate enough deductions to compensate for the lost $5 trillion in federal revenues: "You have refused yet again to offer specifics on how you pay for that 20 percent across-the-board tax cut. Do you actually have the specifics, or are you still working on it and that's why you won't tell voters?" Ryan ultimately says: "It is mathematically possible." But still no specifics. Ryan had signaled before the debate he wasn't to be addressed as "Congressman Ryan" but "Mr. Ryan" — an apparent effort to distance himself from the unpopularity Congress uniformly suffers. Seventeen minutes in, Raddatz was referring to him as "Representative Ryan." Biden interrupted far more than was polite, but Raddatz kept the debate moving with a light but firm touch — allowing the often barbed back and forth Lehrer said he was seeking to foster between President Obama and Mitt Romney. Biden and Ryan talked about the same amount of time during the 90 minutes, according to CNN's tabulation. Romney was himself not punished for his own aggressive posture in interrupting Obama and Lehrer last week; undoubtedly the Obama camp took note. Biden showed restraint just once: When Ryan invoked "Jack Kennedy" as a Democrat willing to work across the aisle, Biden riposted, "Oh, now you're Jack Kennedy!" Somehow he managed not to repeat Lloyd Bentsen's unforgettable line about JFK verbatim. It was impossible not to think he wanted to. Biden showed fire and served as (a liberal) fact checker in real time; Ryan presented an earnestness and seriousness of purpose. And the debate that ensued was substantive. Raddatz, an ABC correspondent, not a network anchor, was the one uncontested winner of the night, serious and even-handed. Perhaps predictably, Fox News talk show host Sean Hannity called her "the worst moderator." Critics of Jim Lehrer last week were numerous, but more so on the political left, given Obama's failure to punch back at Romney. On Thursday night, Raddatz challenged the two candidates on their specifics, though on the whole she didn't fact check either. Instead, she called their bluff on responses that sidestepped and deflected. One of her final queries, about the meanness of political campaigns, came off as naive — something she decidedly is not — and could have been asked of candidates dating back to John Adams and Thomas Jefferson. All in all, however, Raddatz redeemed the idea of an establishment journalist leading the debate.